I live near the Cathedral City of Chichester in West Sussex. It’s a largely affluent place in an affluent county. According to the Land Registry in July of this year the average price of a property in the City stood at £390,559 compared to £248,611 across England as a whole. I was in the city just before Christmas – a last minute shopping trip. Being the last Saturday before the 25th December there were plenty of people carrying bags, doubtless full of presents for family and friends or things to eat over the festive period. 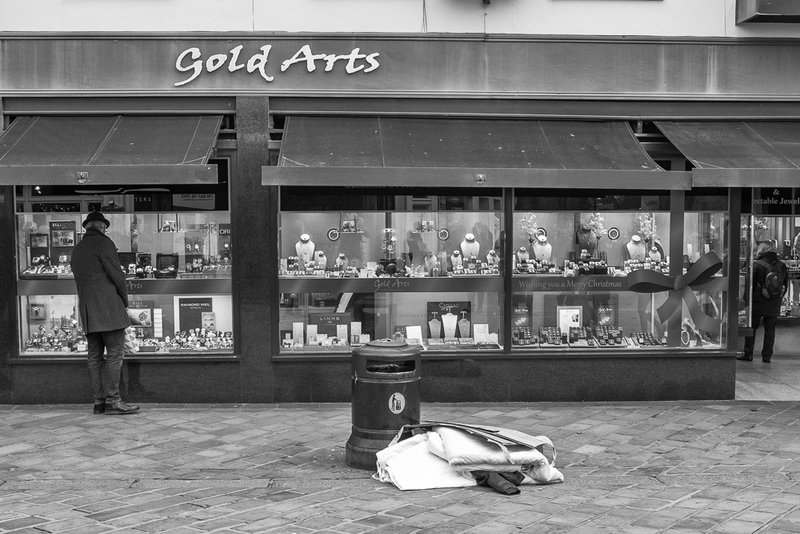 I found it difficult to concentrate on spending money, my mind was in conflict, for what really struck me was the number of homeless people in empty shop doorways. 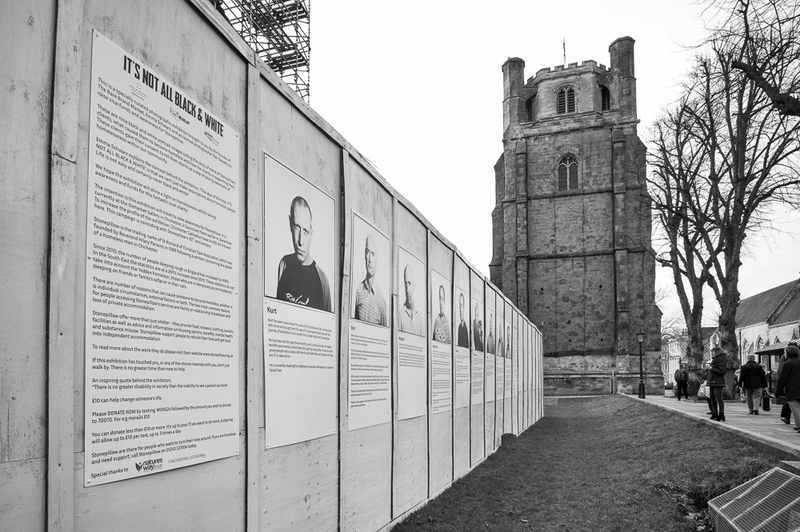 I then came across some large black and white portraits on a section of hoarding outside the cathedral. I was also drawn by its title – It’s Not All Black & White’. I crossed the road and stopped to find out what it was all about. 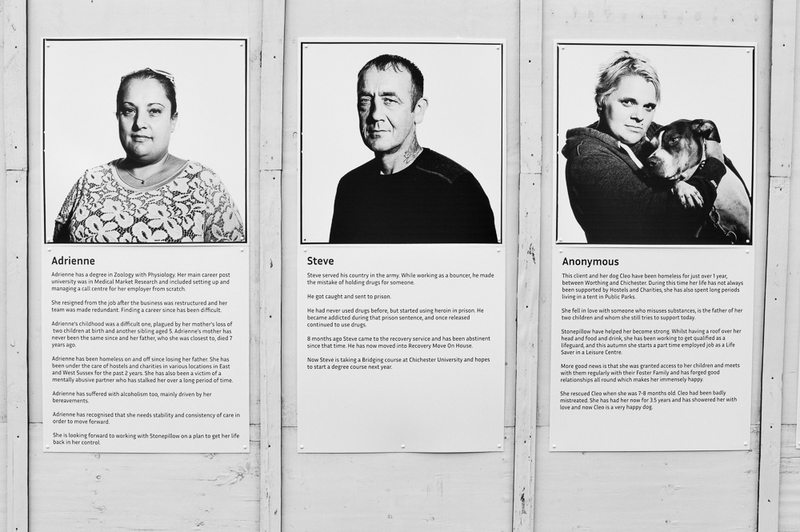 ‘It’s Not All Black & White’ is a specially curated photographic exhibition made up of nine portraits by the acclaimed photographer Dan Stevens, telling the story of some of homeless people who have been helped by a local charity called Stonepillow. 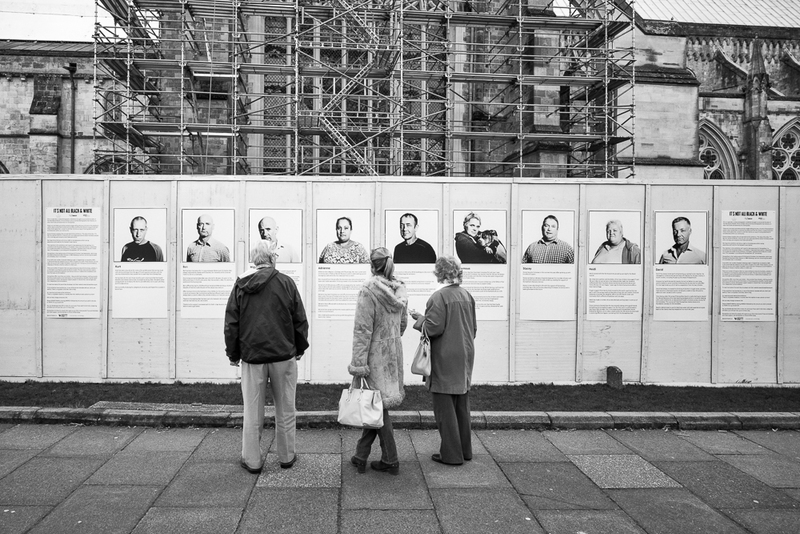 I was moved by their stories and have included some extracts beneath each group of people. Kurt has been a a bus driver for some of his professional life, but has lived with drink and drugs from the age of 15…………. it finishes with more encouraging words – He is currently studying for a degree at university and hopes for a career in Social Care. Ben has been homeless for 3-4 years between Bristol and Chichester…………during his childhood he suffered from verbal and mental abuse. Alcohol became a friend to numb the pain…….Thanks to Stonepillow Ben has been part of fantastic AA recovery group and has now been dry for one month. Miguel used crack cocaine and alcohol which caused long periods of unemployment and the breakdown of his long term relationship. Adrienne has a degree in Zoology with Physiology…… Her childhood was a difficult one, plagued by her mother’s loss of two children at birth and another sibling aged 5…….. Adrienne has been homeless on and off since losing her father……..She is looking forward to working with Stonepillow on a plan to get her life back in her control. Steve served his country in the army. While working as a bouncer, he made the mistake of holding drugs for someone. He got caught and sent to prison. Anonymous. This client and her dog have been homeless for just over a year. Stonepillow have helped her become strong. Whilst having a roof over her head and food and drink, she has been working to get qualified as a lifeguard…..
Stacey became homeless in the summer this year after splitting up with his wife of 13 years……..he is now rebuilding his life with the support of Stonepillow, volunteering in the community, attending Chichester University and is looking forward to the future. Heidi’s husband served in the Falklands War and suffered with Post Traumatic Stress Syndrome and alcohol abuse and home life was not very happy. 7 years ago he died of pneumonia after a brain hemorrhage…………..later Heidi suffered a breakdown, ran away and has made a number of suicide attempts. With support from Stonepillow for the first time in a while she is starting to feel stronger. David was a PE teacher for 26 years, including 19 years as Head of Department. However he had three painful events; he lost his father to a very long painful battle to cancer; following this he also lost his wife after his marriage broke up, which led to a separation from his two children. David had always increased his drinking of alcohol in tough times, and this habit became a downward spiral……Since being under the wing of Stonepillow David is really starting to rebuild his life. They are all tragic tales but there is also hope. 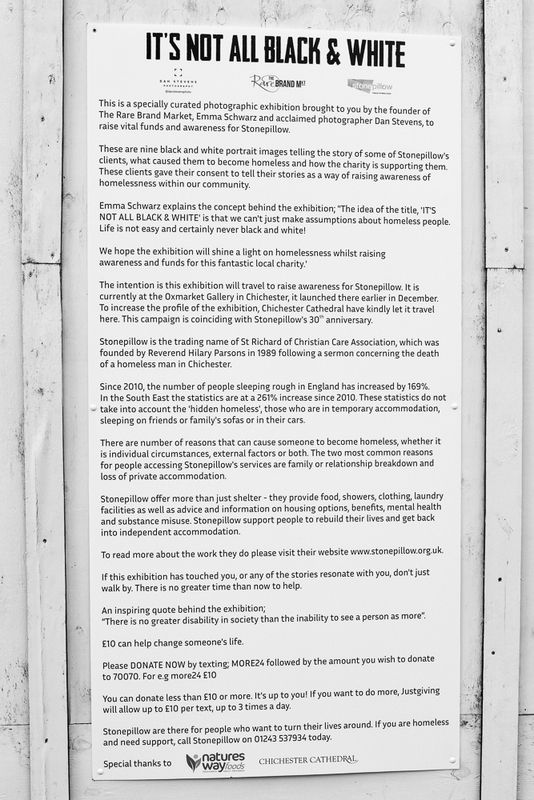 The concept behind the exhibition and the title – It’s Not All Black & White is that you can’t just make assumptions about homeless people. The message is a strong but simple one – Life is not easy and certainly never black and white! 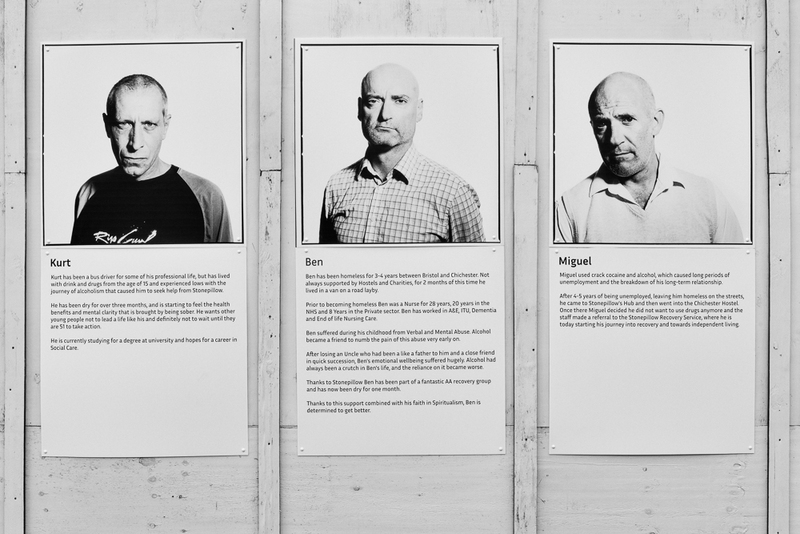 Sadly since 2010, the number people sleeping rough in England has increased by 169%. In the South East there has been a 261% increase over the same period. 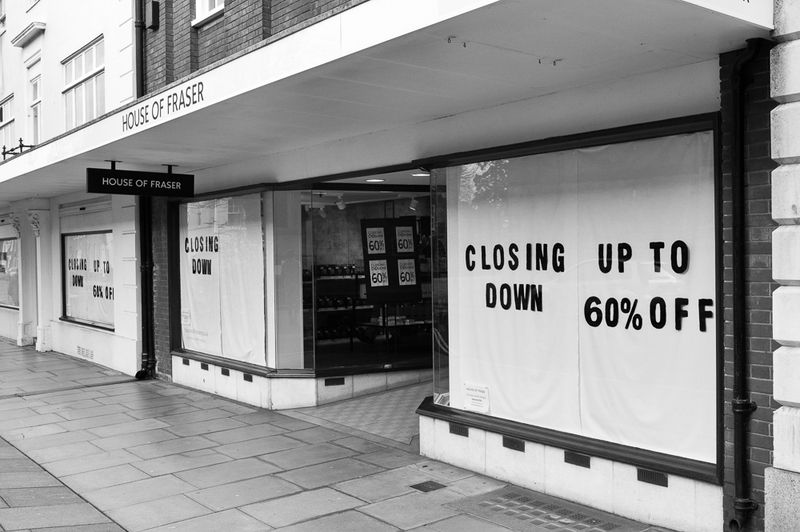 As I walked around taking these pictures I was aware the faces in the portraits were looking across the road to the House of Fraser Department store which is scheduled to close in January. 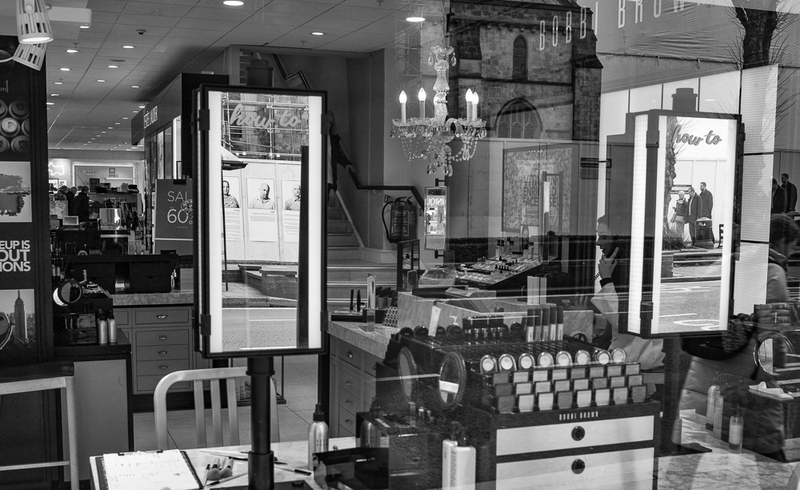 Their reflection could be seen in a mirror in one of the shop’s windows. 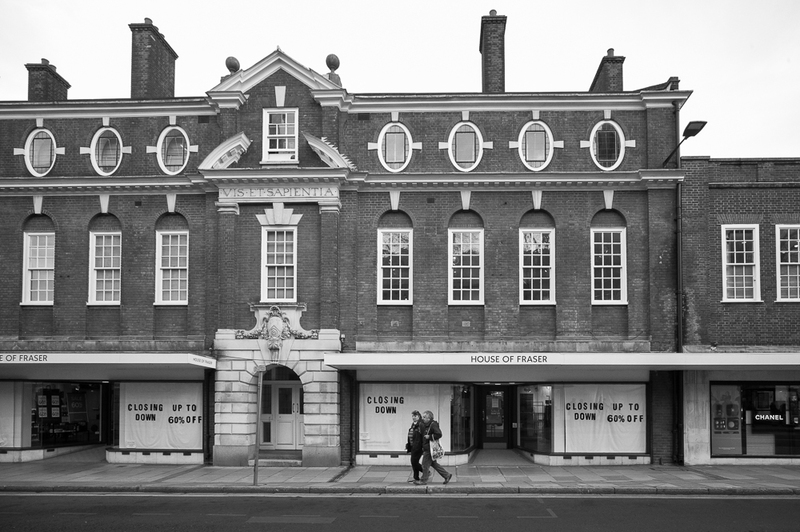 It’s a very fine building, typical of Chichester but now facing an uncertain future…..a reflection of how difficult things are in this country for High Street retailers. 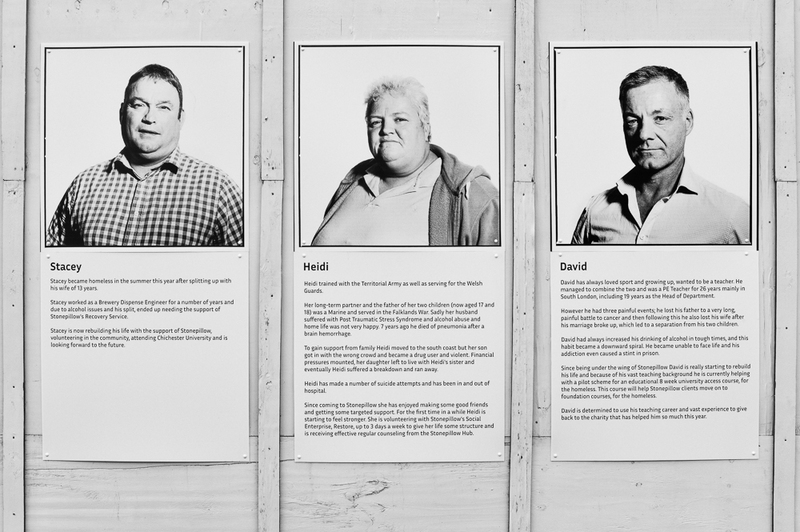 Losing your job and unable to secure other employment is often cited as one of the contributory factors behind homelessness. I only hope that none of the employees in this store become one of the faces on the opposite side of the road in the future. From West Street I turned into North Street and as I did so I came across a pile of cardboard, a duvet, some blankets and a jacket all by a waste bin. With an optimistic heart I hoped these were the discarded belongings of a homeless person who had been offered shelter over Christmas, possibly by Stonepillow. Alternatively they could have been put there by one of the shopkeepers ‘tidying’ up the city and waiting for the refuse van to come and collect……. I will never know, but sadly whatever the truth, I can be sure there will be another homeless person around the next corner. Stonepillow is the trading name of St Richard of Christian Care Association, and was founded by Reverend Hilary Parsons in 1989 following a sermon concerning the death of a homeless man in Chichester. The campaign coincides with Stonepillow’s 30th Anniversary. The full text of ‘It’s Not All Black & White’ can be read by clicking on the photo below. This will probably be my last post of 2018. Thank you for reading this entry and for visiting my website. Thank you too for your comments which are always appreciated. It only remains for me to wish you a very happy and peaceful New Year wherever your home might be. Another year over – a time to reflect and consider.